Muscles. I have muscles that are sore. Go figure. The Wii Fit party was at my house the other night. It was a riot. The team arrived, flew into action, installed three Wii Fit set-ups (using our TV plus two they brought), commandeered the kitchen to prep and plate food, made sangria, stashed all the bags and boxes in the garage and started the indoctrination of the guests. People laughed and "ski-jumped" and ate and "hula-hooped" and drank and "rhythm-boxed". They stared with great concentration at the TVs as they tried to ride the bubble down the stream or gaze mindfully at a burning candle. There was aerobic stepping, and yoga, and tightrope walking, not to mention penguin sliding and table tilting. At the end of the evening, the team handed out Wii Fits (and yoga mats and exercise suits) to the guests. There was shrieking and carrying on like we were on Oprah or something. And then they cleaned up, stashed some tasty leftovers in my fridge and went merrily on their way, spreading Wii cheer in their wake. The muscles across/under my scapulae are sore. I think it was the boxing. Running up and down the stairs all the time means that my leg muscles aren't too terrible. But boxing? I don't do a lot of hitting. I think this might could actually be a way to get in shape in the privacy of my own home. You still have a chance to win a Wii Fit (and the Wii console). Pop on over to this post before midnight tomorrow, and let loose with why you need one to get you moving. we are getting one for xmas! squee! Sorry, that was a preview of what I will do if I win this thing. I can't believe you were lucky enough to have the Wii people come over and do this for you and your peoples. I REALLY want to win. Have I mentioned that? A few times? Oh, okay. But for reals. I WANT A WII FIT! Those are the best kind of sore muscles, aren't they? Sounds like you had a great time. I'm such a tech-tard that I don't even understand what I would need to get the Wii fit thing to work. Do you need some other Nintendo box thingy? That's a rhetorical Q. I'll do my own research. There will be Wii under our tree this Christmas. I hear the Wii Fit is great fun. That sounds like my kind of party. And snowboarding without the snow. How can you go wrong with that? I am a big fan of the table tilt. I can't figure out why. hey, it isn't a party until someone is sore or something like that. Oh WOW!! I am so excited! How fun!! When I win I'm totally gonna blog about it with tons of pictures, link back to your site and thank you !! You are so lucky to have them come and treat you like queens!! Love it!!!! Exercising while drinking--I could really get on board with that! I got my Yes We Did stickers from Move.On today--the kids are so excited to have them. Oh my gosh, you must be the most popular woman ever now - Wii fits! yoga matts! exercise suits! 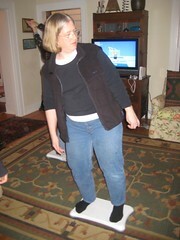 i know that we love our Wii fit - it's fun! ACK! I missed the deadline. This is what happens when you get sick and stay in bed rather than keeping up with blogs. That sounds like a riot! My Wii "adviser" said that the skiing and snowboarding are awesome, but to stay away from the tennis (tennis elbow injury, whoa). She also loves the Dance Nation game that uses the Fit ... although I may have messed up the name? Just in case you need some ideas for WF Party, Take Two.